The complete genome sequence of a human rabies virus, strain H-08-1320, from Sri Lanka was determined and compared with other rabies viruses. The size of the genome was 11,926 nt, and it was composed of a 58-nucleotide 3′ leader, five protein genes – N (1353 nt), P (894 nt), M (609 nt), G (1575 nt), and L (6387 nt) – and a 70-nt 5′ trailer. The intergenic region G–L contained 515 nt. The sizes of the nucleoprotein, phosphoprotein, matrix-protein, glycoprotein and large-protein was 450, 296, 202, 524 and 2,128 residues, respectively. The phosphoprotein and large protein were one amino acid shorter and longer, respectively, than those of most rabies viruses. 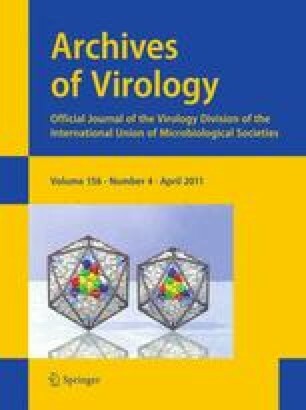 The glycoprotein of H-08-1320 had a unique amino acid substitution at antigenic site I. Whole-genome phylogenetic analysis showed that strain H-08-1320 formed an independent lineage and did not cluster with rabies viruses from other countries. The online version of this article (doi: 10.1007/s00705-010-0905-8) contains supplementary material, which is available to authorized users. This research was supported by a Grant-in-Aid Scientific Research B from Japan Society for the Promotion of Sciences; grant number: 20406026.